Welcome back to another week of discussion for THE UNDERGROUND RAILROAD! This week, we are going to discuss the three more chapters/sections of the book, including ETHEL, TENNESSEE, and CAESAR. Please read on for specific questions to address, but please feel free to chat about anything beyond these questions that you deem fit. We get a little glimpse into Ethel's life in this chapter. Does this change your initial impressions of her based on the last section? Why or why not? Last week, I asked if you thought Ethel had give Cora kisses while she was sleeping through a fever. We discover here that those kisses are real, but are accompanied by "two kinds of feeling." What kinds of feeling do you think they might be? The appearance of Homer adds an interesting relationship to Ridgeway and the story in general. Share your thoughts on his appearance and/or role in the story. Cora was rescued by three "runaways." What do you believe was their story? We finally get to learn more about Caesar, his past, and his intentions. With this new information, what do you take away regarding the man and his character? Next week, we will be back on Monday to chat about the next three sections: INDIANA, MABEL, and THE NORTH. This is our last round of chapters, and I am looking forward to reading the conclusion and chatting with you all. Welcome to another week of discussion for THE UNDERGROUND RAILROAD! Today, we are here to discuss the next three chapters/sections of the book, including SOUTH CAROLINA, STEVENS, and NORTH CAROLINA. Please read on for specific questions to address, but I encourage you to take your own route if you so desire. Cora's life changed drastically after getting on the underground railroad. In addition to getting used to her new name of Bessie, what other changes did she have to get used to? What do you believe would be the hardest change to become accustomed to? "Stolen bodies working stolen land." Comment. Dr. Bertram shares the truth of the hospital's work with the black population, and Sam passes on the information/warning to Cora and Caesar. While reading this, my mind flashed to the biography THE IMMORTAL LIFE OF HENRIETTA LACKS. What similarities do you see between the medical stories? A new character is introduced: Stevens, a medical student and body snatcher. What are your impressions of this man? What is the meaning of the following quote in your own words? "And if you could make a study of the dead, Steven's thought from time to time, you could make a study of the living, and make them testify as no cadaver could." Martin's father left him a treasure when he died. "The treasure, of course, was the underground railroad. Some might call freedom the dearest currency of all, but it was not what Martin expected." What do you imagine was Martin's initial reaction to discovering this treasure? Comment on freedom as currency, and the underground railroad as treasure. Cora did not see Ethel beyond the first night she arrived. That is, until Cora became ill and Ethel became her caregiver. Cora imagined a motherly kiss while she was in the midst of fever. Do you think the kiss was real or imagined? Why or why not? What are your thoughts at the conclusion of this chapter? Do you feel any hope for Cora? How about Martin and Ethel? Tell me what you are thinking of the story so far, whether you answer the specific questions or not! I am excited to chat more about this book! Next week, we will be back on Monday to chat about the next three sections: ETHEL, TENNESSEE, and CAESAR. This is a shorter week of reading, so if you are behind in reading it's a great time to catch-up. See you all back again next week. Welcome to the first week of discussion for THE UNDERGROUND RAILROAD! Today, we are here to discuss the first three chapters/sections of the book, including AJARRY, GEORGIA, and RIDGEWAY. Please read on for specific questions to address, but I encourage you to take your own route if you so desire. In this first chapter, we are first introduced to Cora. What are your first impressions? The bulk of the chapter explores Cora's grandmother, Ajarry and her story. How much of Ajarry's story influences Cora? Comment on the opening and closing of the chapter: "This was her grandmother talking." vs "This time it was her mother talking." Let's talk about Jockey. What is the importance of his character to the story within this chapter? How did the Hob affect Cora, both positively and negatively? What was it that caused Cora to step in between Chester and Terrance at Jockey's party? Why did Chester not want anything to do with Cora after she tried to save him? What attracted Caesar to Cora? Why did he choose her to run away with? Comment on your initial reaction to the underground railroad. Was it described as you expected? Why or why not? In this chapter, we meet Ridgeway. What are your first impressions of him? It was Ridgeway that was the lead behind finding Cora's mother when she escaped. Now, he is on the case of Cora herself, and is determined more than ever to destroy the underground railroad. Why does he feel so strongly about this destruction? Feel free to answer any or all of the questions listed above. Feel free to address any that you feel that I have missed. Feel free to link up below, or feel free to just comment here at the bottom of the post. Next week, we will be back on Monday to chat about the next three sections: SOUTH CAROLINA, STEVENS, AND NORTH CAROLINA. See you all back again next week. BBC Releases FREE Audiobook of THE UNDERGROUND RAILROAD!! 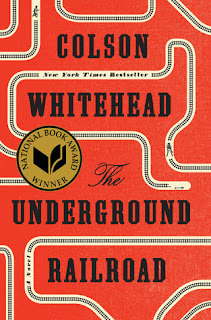 ICYMI: We are reading THE UNDERGROUND RAILROAD by Colson Whitehead this month for our #12mos12rals. What could be better timing than a little FREE copy of the audiobook?!? You have only 18 days left to take advantage of this offer (from the time this post goes live)! I discovered this fun little surprise thanks to an announcement from Book Riot, but you can find the direct link here. Click here for our full reading schedule for the month. Today is the first of March, which means another readalong for #12mos12rals here at Book Bloggers International! 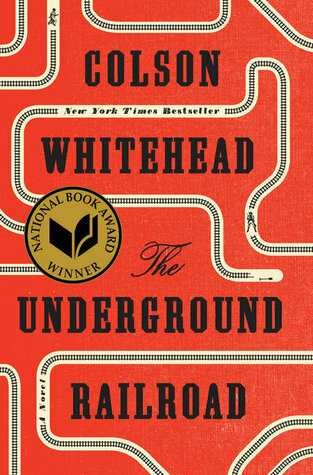 During March, we will be reading and discussing the National Book Award Winner, The Underground Railroad by Colson Whitehead. For those who may not be familiar with the book, here is a description from the publisher, Double Day Books . . .
For those joining in the week-by-week reading, here is the official schedule. Feel free to read just the selected reading listed below, or read ahead because you can't put the book down. Then, come back and discuss the book using the guided questions and conversation that I will share every Monday. The only thing we ask is that you do not share spoilers past the noted readings for those that read ahead. If you have questions, just let us know in the comments section below. If you are joining us, give us a little wave. I look forward to reading with you this month!